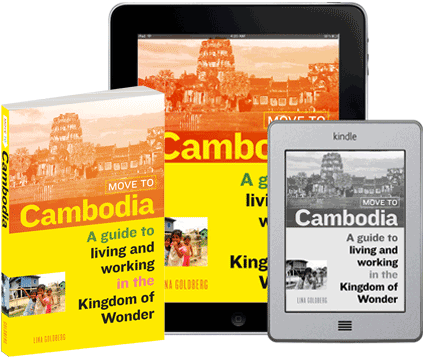 In Sihanoukville a new place to eat is exciting news (well, for us at least! ), so we were pleased to see the recent arrival of Mike’s Burger House. 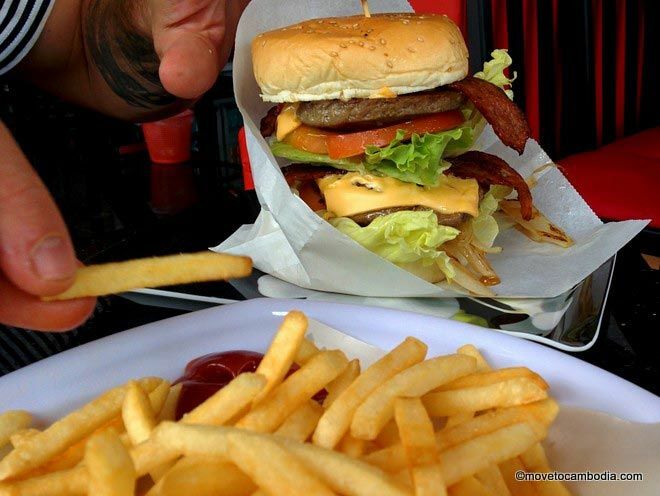 Phnom Penh expats have told us about the solid reputation of Mike’s Burgers House — they specialize in California-style burgers inspired by legendary American fast food chain In-N-Out — so we thought we should check it out for ourselves. I hope you’re hungry! In-N-Out-style double bacon cheeseburger at Mike’s Burger House. 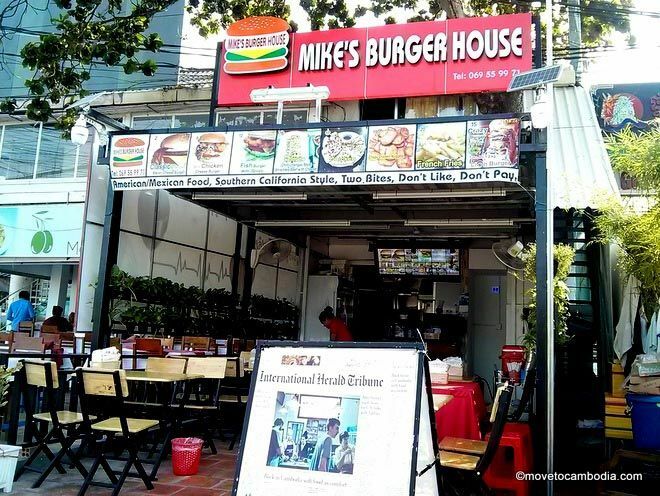 Located opposite the Golden Lions next door to Olive and Olive (and not too far from the recently expanded Ernie’s Burgers), the Sihanoukville branch of Mike’s Burger House is the 5th to open in the Kingdom following three in Phnom Penh and one in Siem Reap. Owned by Mike Im, a Cambodian who moved to the US after the fall of the Khmer Rouge, the restaurant seeks to recreate the burgers that he loved so much during his 30 years in California. Our first impressions were not great: it’s quite a small place with 24 seats and was lacking in atmosphere — some music in the background would have helped — this is an area where Ernie’s Burgers definitely has the upper hand, with their new upstairs area that is a nice place to relax after a meal. In addition to an array of beef burgers (many with bacon), the menu includes chicken and fish burgers, sloppy Joes, chicken nuggets, and Tex-Mex style dishes such as burritos, quesadillas, and fajitas. Prices were a little higher than we expected in a town where you can have a decent meal and a beer for $3; the house special cheeseburger is priced at $3.75 all the way up to the gluttonous Lion burger that boasts 1.2 kg (2.6 lbs) of beef. We weren’t that adventurous, so we went for ‘classic American’ bacon cheeseburgers at $4.25 with a small side of fries for $2.75. The staff were attentive, polite (and abundant! ), and our food was served quickly and was very good. Our burger came with iceberg lettuce, tomato, onion, and burger sauce and was a really good size, the bun was soft but held together well. The patty was thick, juicy, and delicious. Lacking in atmosphere but big on taste. We really liked how everything tasted fresh and the fries were excellent. We shared a small serving of fries and there really was enough for two, which gives some justification to the price. Everything was served with help-yourself bottles of good Heinz ketchup and Sriracha sauce. Refreshments-wise, they serve a range of soft drinks including imported brands like Arizona soda and Vanilla Coke as well as mammoth cans of Monster energy drink. They also serve milk and protein shakes as well as American root beer floats. If you like a beer with your burger, they stock bottles of Angkor, Corona, and Cambodia beer, and are one of the rare places outside the brewery where you can pick up a bottle of Five Man Beer. Overall we really enjoyed the food and chatting to the staff at Mike’s Burger House. Yes, it’s lacking in the ambience department, but it’s a nice addition to the Sihanoukville burger scene and we’ll be back soon to try one of the many other options on their menu. Open daily 9 a.m. to 10 p.m. 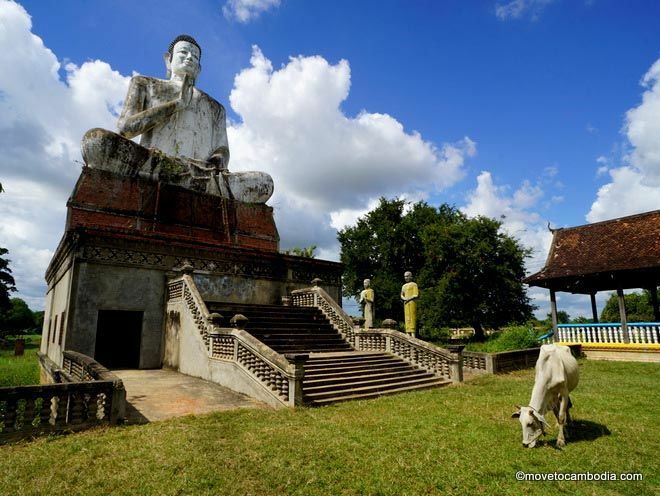 This entry was posted in Sihanoukville, Food and tagged Mike's Burger House. Bookmark the permalink.